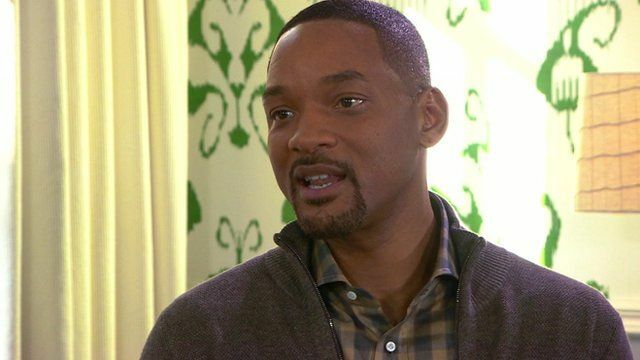 'Oscars row is about inclusion not awards' Jump to media player Actor Will Smith talks to BBC Breakfast's Charlie Stayt about his latest film Concussion and the race row surrounding the Oscars. Jada Pinkett Smith to boycott Oscars Jump to media player Film director Spike Lee and actress Jada Pinkett Smith have said they will not attend next month's Oscars ceremony because of the mostly white nominees. Public 'dazzled' by NFL, says author Jump to media player The author of Concussion, on which an upcoming Hollywood film is based, says the public is "dazzled" by American football, and ignores serious injuries. Father and son win Razzies double Jump to media player Will Smith and his son, Jaden, have won worst actor prizes at the annual Razzie awards in Los Angeles. BBC Breakfast presenter Charlie Stayt speaks to actor Will Smith about Oscars boycott, his dream dinner party and his new film, Concussion.